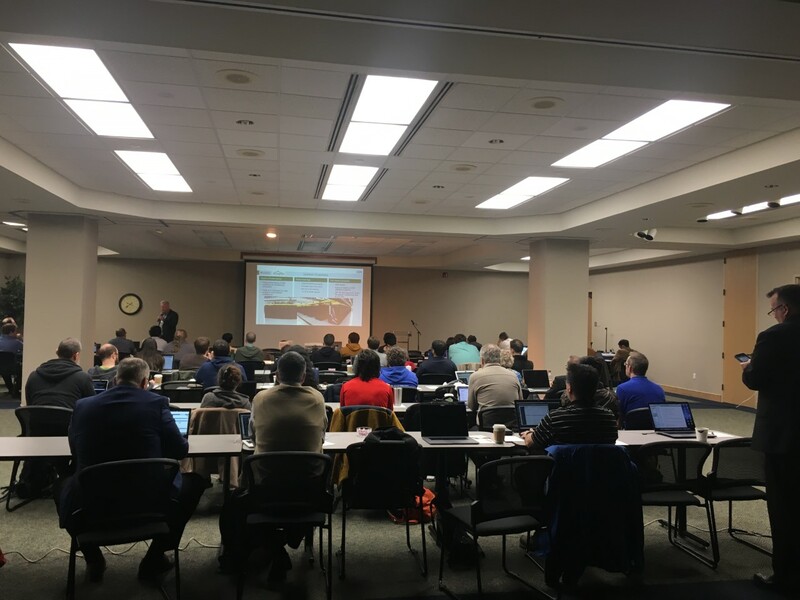 We hosted a 2-day workshop at UTK on PowerAI. A team of IBMers led by Jamie Syptak has given enlightening talks and training sessions to more than 70 attendees over the two days. Jack Wells and Toni Skjellum presented research successes at ORNL and UT Chattanooga respectively. The program can be found HERE. EECS Professor Michela Taufer, Jack Dongarra Professor in High Performance Computing, has been selected as a 2019 HPCwire Person to Watch. 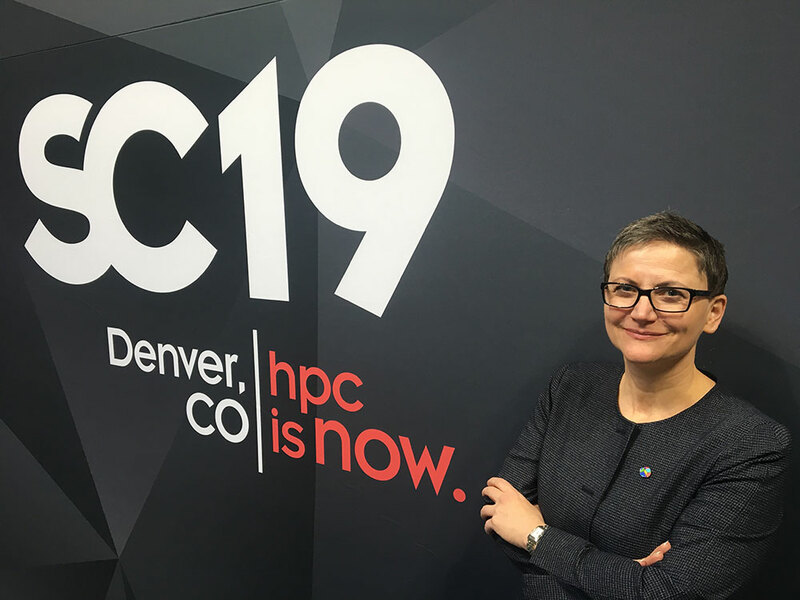 HPCwire names its annual list of People to Watch to foster a dialogue about the industry and give the readers a personal look at the hard work, dedication, and contributions from some of the best and brightest minds in HPC. For more information click HERE. EECS Professor Michela Taufer, Jack Dongarra Professor in High Performance Computing, has been selected to receive a 2019 IBM Faculty Award. This award is highly competitive and recognizes her leadership in High Performance Computing and its importance to the computing industry. For more information click HERE. Dr. Taufer presented our work on the power of combiner optimizations in Mimir - our MapReduce over MPI software at IPCADS in Singapore. Join the Mimir users by downloading the very last version of the software HERE. 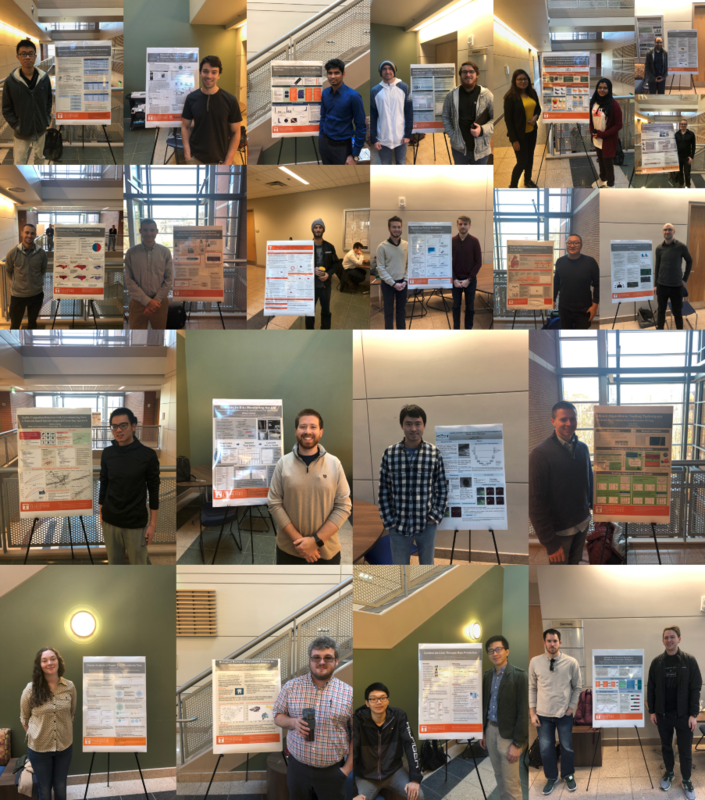 The End of Semester Poster Session for Data Analytics CS594 /C690 Fall 2018 took place on Mon, Dec 3, 2018, 9:30am-11am in MinKao in the atrium. The graduate students presented exciting posters about their work in big data analytics on high-performance computing and cloud computing. Pictures of the event are posted HERE. Mimir, our MapReduce over MPI framework is now available at https://github.com/TauferLab/Mimir/releases. Come by our UT booth at SC18 (#4113) to learn more about Mimir performance. Our work "On the Power of Combiner Optimizations in MapReduce over MPI Workflows" was accepted at IEEE 24th International Conference on Parallel and Distributed Systems (IEEE ICPADS 2018). This is work with Dr. Pavan Balaji and Argonne National Laboratory. Dr. Taufer presents "Modeling Record-and-Replay for Nondeterministic Applications on Exascale Systems" at the 2018 CCDSC workshop (ICL) in Lyon. Stephen presenting poster: "Creating a Portable, High-Level Graph Analytics Paradigm For Compute and Data-Intensive Applications"
Dr. Taufer visits the Shenzhen Institutes of Advanced Technology for Workshop on Data Intensive Computing. 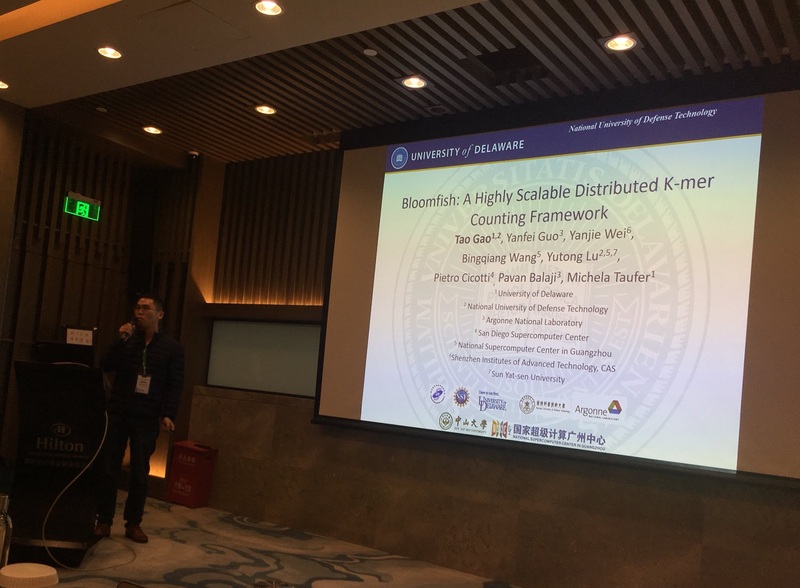 Tao Gao present our work on Bloomfish: A Highly Scalable Distributed K-mer Counting Framework at ICPADS17. 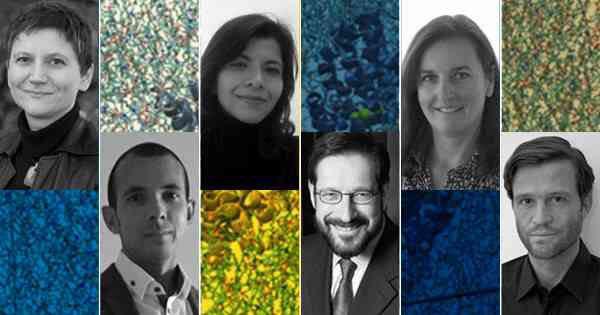 Dr. Taufer leads a research team advancing data analytics for molecular dynamics, that includes Rafael Ferreira Da Silva, Trilce Estrada, Harel Weinstein, Ewa Deelman and Michel A. Cuendet. Michela Taufer with Victoria Stodden, Matthew Krafczyk, Bruce Childers, Andreas Schreiber and Miriam Leeser speaking about reproducibility and uncertainty in HPC. Dr. Taufer gave an engaging keynote of how to adapt and optimize MapReduce frameworks for HPC environments at EuroMPI/USA 2017. 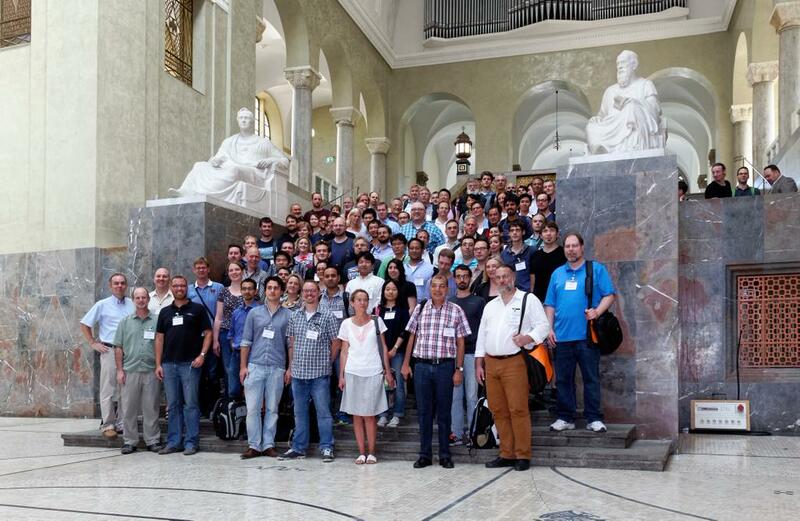 Almost 500 students participated in the UG Symposium. Fantastic poster and presentation of Liz and Thomas about "Data Analytics for Modeling Soil Moisture Patterns across United States Ecoclimatic Domains". Dr. Taufer is among the nineteen faculty members at UD who were promoted to professor this year. Congratulations Dr. Taufer! Read more in the UDaily. 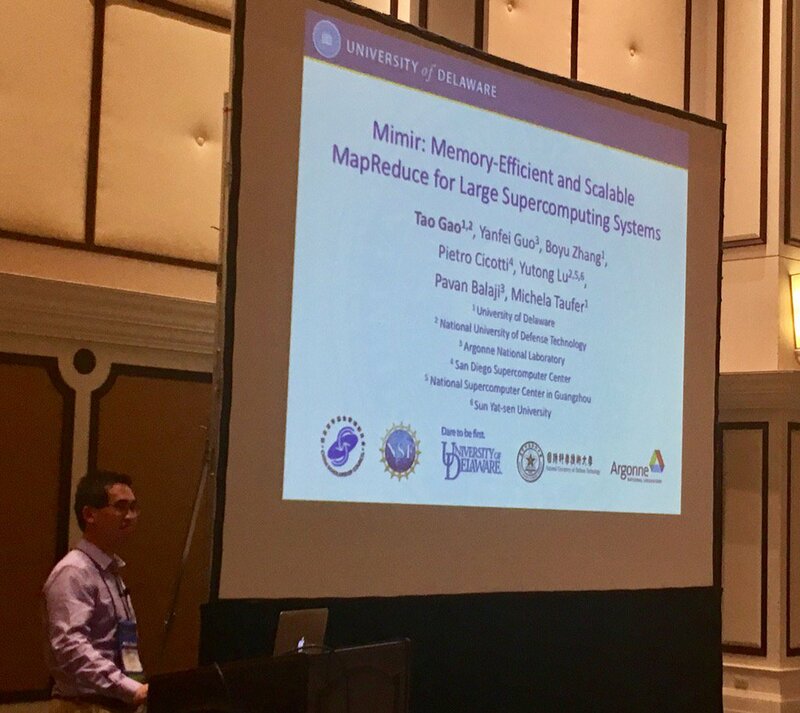 Tao presented successfully our paper "Mimir: Memory-Efficient and Scalable MapReduce for Large Supercomputing Systems" at IPDPS 2017 in Orlando Florida. Congratulations Tao! Read the paper at IEEE Xplore. Drs. Taufer and Vargas have recieved a new NSF grant to support development of cyberinfrastructure tools for precision agriculture. Read article in UDaily. Stephen Herbein successfully proposed his PhD work titled "Advanced Schedulers For Next-Generation HPC Systems" in front of his committee composed of Michela Taufer (Advisor, UD CIS), Sunita Chandrasekaran (UD CIS), Rui Zhang (UD CIS), Martin Schulz (Lawrence Livermore National Laboratory), Dean Hildebrand (IBM), and Dong Ahn (Lawrence Livermore National Laboratory). Dylan Chapp defended his MS thesis on "Study of the Impact of Non-determinism on Numerical Reproducibility and Debugging at the Exascale." Congratulations Stephen and Dylan. Dr. Taufer brings expertise is high performance computing (HPC) and HPC infrastructures (i.e., software and hardware) for data analytics to the Institute for Financial Services Analytics (IFSA) at UD. Read article in UDaily. 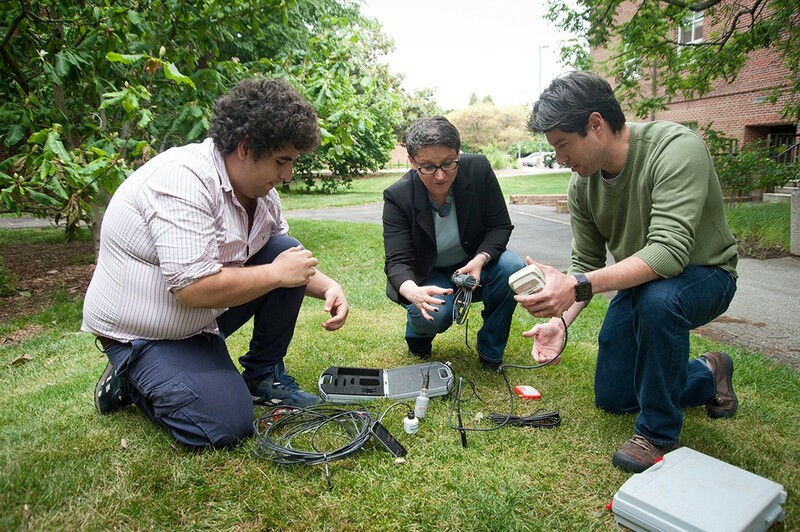 Vargas and Taufer were one of four teams who received University of Delaware Research Foundation (UDRF) funding to study how soil moisture data can be extracted from the vast environmental data now available. Read article in UDaily. 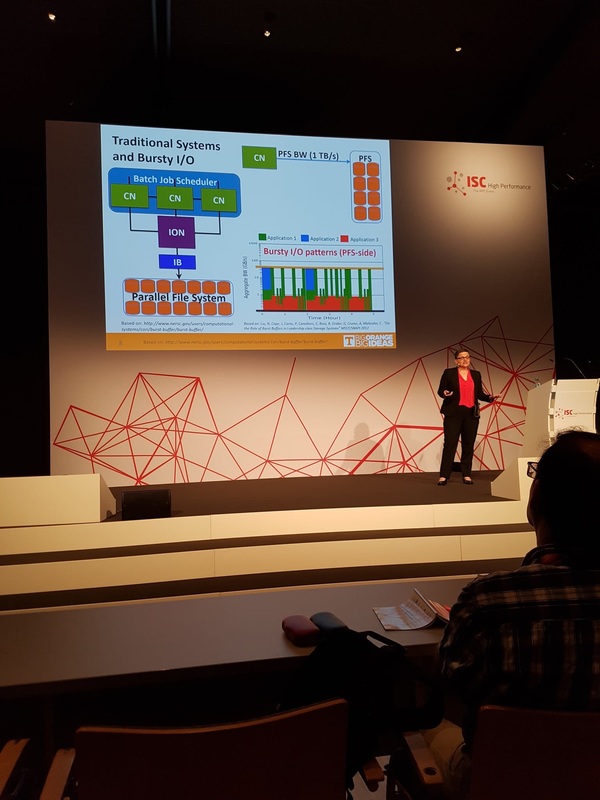 Taufer has been elected general chair of the 2019 International Conference for High Performance Computing, Networking, Storage and Analysis (SC19). Read article in UDaily. Our work titled "In situ data analytics and indexing of protein trajectories" has been accepted in the Journal of Computational Chemistry (JCC) Read the article in JCC. Congratulations Travis! Our paper titled "Mimir: Memory-Efficient and Scalable MapReduce for Large Supercomputing Systems" has been accepted at IPDPS 2017. The advanced program can be found at: IPDPS 2017 Program. Congratulations Tao! 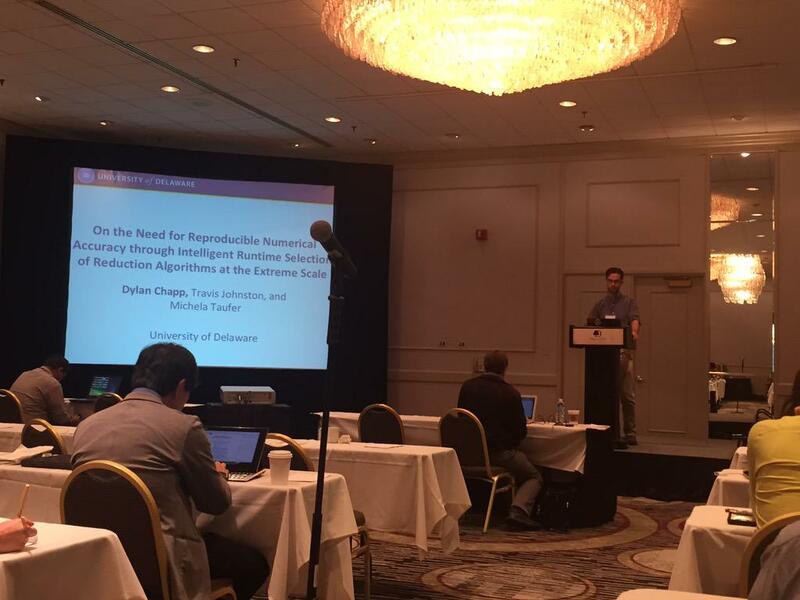 Dr. Taufer co-author of paper on enhancing reproducibility for computational methods. Read article in Science. Our group is part of the team presenting research at the UD research booth at SC16. Come by to learn about our work! Our work on "HYPPO: A Hybrid, Piecewise Polynomial Modeling Technique for Non-Smooth Surfaces" is one of the four best paper finalists at IEEE SBAC-PAD. Congratulations Travis and Connor! Dr. Taufer presents work on I/O and data analytics at the Workshop on Clusters Clouds and Data for Scientific Computing (CCDSC). 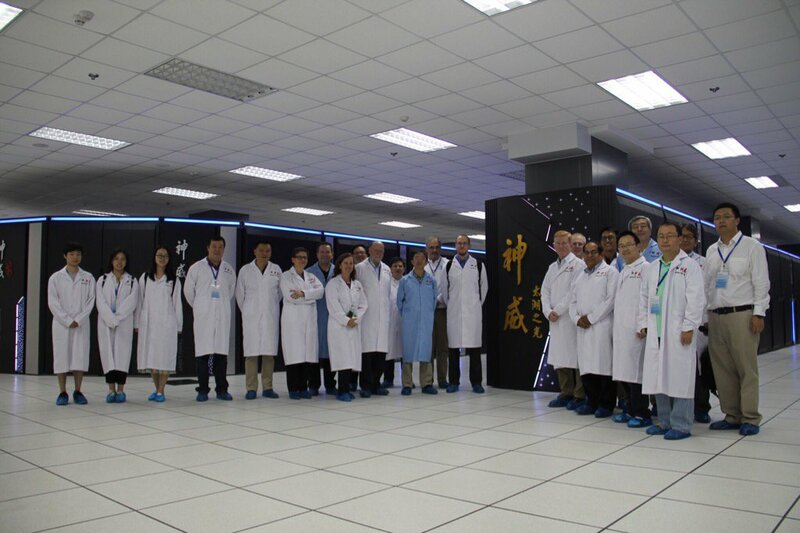 Dr. Taufer presents work of our group on in-situ analysis and HPC at Wuxi and Guanghzhou Supercomputer Centers. Dr. Taufer is keynote at the IEEE Cluster Conference, Taipei, Taiwan. Taufer's talk is available HERE. 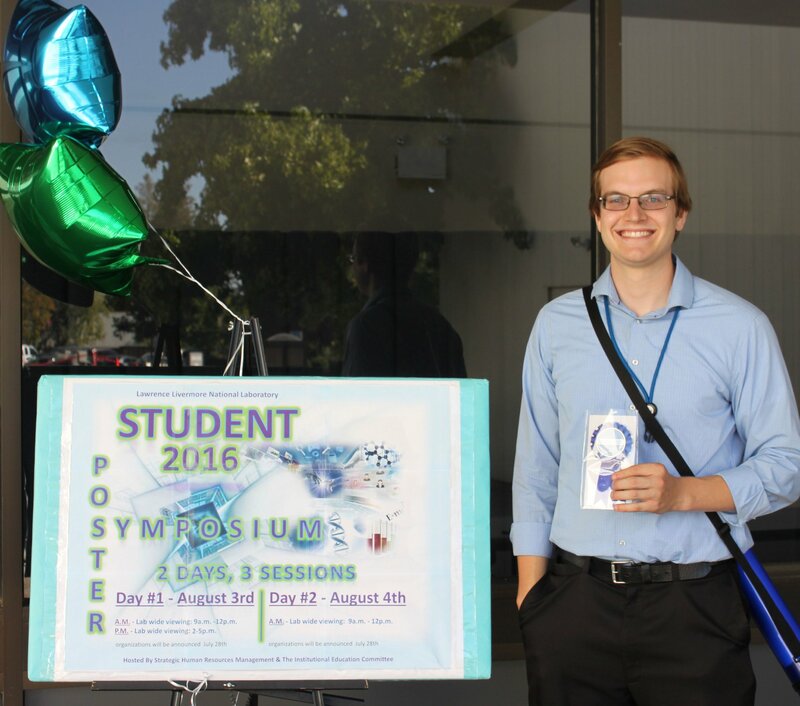 Congrats to Stephen Herbein, winner of LLNL Best Student Poster for his LLNL summer work. Dr. Taufer is keynote at the 7th Workshop on Scientific Cloud Computing (ScienceCloud), Kyoto, Japan. Our group presented a talk on "Exploring Scalable Implementations of Triangle Enumeration in Graphs of Diverse Densities: Apache Spark vs. GPUs" at GTC 2016. Congratualtions Stephen and Travis! Our paper on "Scalable I/O-Aware Job Scheduling for Burst Buffer Enabled HPC Clusters" was accepted at ACM International Symposium on High-Performance Parallel and Distributed Computing (HPDC). This is work in collaboration with LLNL. Congratulations Stephen! 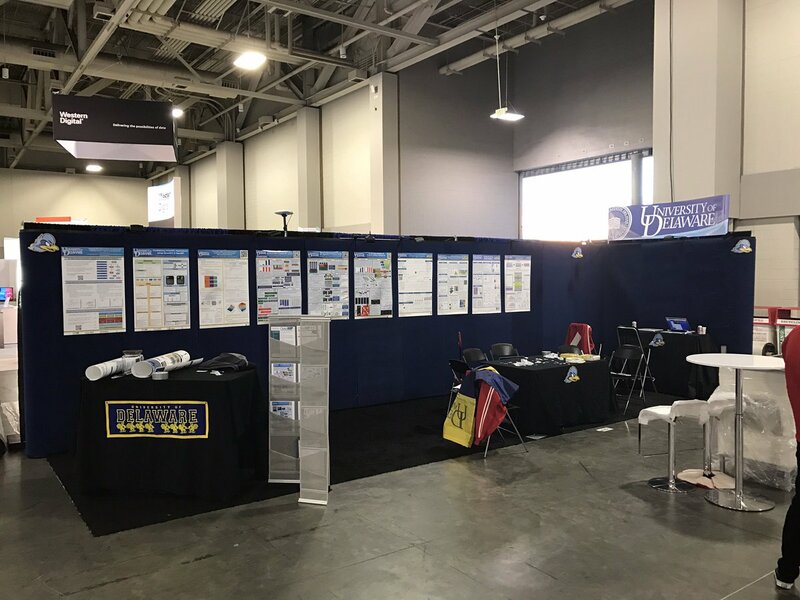 Dr. Taufer presented our work titled "In-Situ Data Analysis of Protein-folding Trajectories" at the 251st ACS National Meeting and Exposition - Division of Computers in Chemistry: From Dynamics to Function & Back Again: Adventures in Simulating Biomolecules in San Diego. Our paper on "Resource Management for Running HPC Applications in Container Clouds" was accepted at the International Supercomputing Conference (ISC), to be held in Frankfurt, Germany, from June 19-23, 2016. This paper summarizes the efforts of six graduate students who worked on their OS project in Spring 2015 in collaboration with Seetharami R. Seelam at IMB T.J, Watson. At SC15, a team of computer scientists met to discuss abour research reproducibility in a BoF. The slides and report of the discussion are now available HERE. 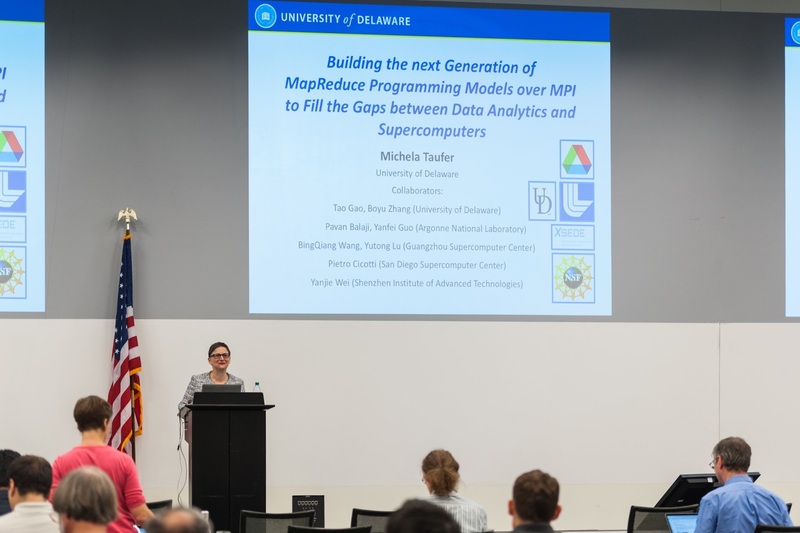 The University of Delaware’s Michela Taufer has been named a distinguished scientist by the Association for Computing Machinery (ACM), the world’s leading association of computing professionals. Read more here. The University of Delaware is partnering on the South Big Data Regional Innovation Hub (South BD Hub), which will be managed jointly by the Georgia Institute of Technology and the University of North Carolina’s Renaissance Computing Institute (RENCI). Dr. Taufer leads the UD team. Read more here. Dr. Taufer Operating Systems (OS) class at the University of Delaware is featured in UDaily for the collaboration with Seelam Setharami from the IBM Thomas J. Watson Research Center on defining industry-relevant OS projects for her class. Work on "A Genetic Programming Approach to Design Resource Allocation Policies for Heterogeneous Workflows in the Cloud" with the group of Dr. Trilce Estrada at UNM was accepted at the ICPADS conference that takes place in Melbourne, Australia on December 14 -16, 2015. We attended IEEE Cluster 2015 where we presented our work on reproducible accuracy and three posters on CPU, network, and I/O QoS for Docker. Our paper and slides are now online. Read more about how we efficiently use static scheduling policies on Cloud systems. Our paper and slides are now online. Read more about how we use traditional HPC prediction techniques for climate predictions. Our work on using Graphical Processing Unit (GPU) resources (FEN ZI) to extend the sampling for molecular simulations to study the thermodynamics of carbon nanotube assembly was accepted to the JCC and was selected as cover image for the June edition. Dr. Taufer will serve as Acting Director for the academic year 2015-2016 of the Center for Bioinformatics & Computational Biology at the University of Delaware. Our group was awarded an NSF grant to study numerical errors due to limited arithmetic precision and non-determinism associated with multi-threading on exascale platforms. Our group was awarded an Army grant to study I/O performance and in-situ data analytics on exascale platforms. Our paper on "From HPC Performance to Weather Modeling: Transforming Methods for HPC Predictions Into Models of Extreme Climate Conditions" has been accepted as a full paper at the eScience 2015 conference, to be held in Munich (Germany) on Aug 31 - Sep 4, 2015. Congratulations Ryan and Vivek! Our paper on "On the Need for Reproducible Numerical Accuracy through Intelligent Runtime Selection of Reduction Algorithms at the Extreme Scale" has been accepted as a full paper at the IEEE Cluster 2015 conference, to be held in Chicago, Illinois, USA, Sept. 8-11, 2015. Congratulations Dylan and Travis! Our paper on "A Testing Engine for High-Performance and Cost-Effective Workflow Execution in the Cloud " has been accepted as a full paper at the International Conference on Parallel Processing (ICPP), 2015, to be held in Beijing, China on Sept. 1-4, 2015. Congratulations Vivek and Trilce! Boyu Zhang received the CIS Lauri Pfeffer Shinn Memorial Award for her contributions to the CIS department and in recognition of her academic success. Ryan McKenna received the Outstanding Junior Student Award for his scholastic achievements. Our group won the Scale Challenge at CCGrid 2015! Our work on "Accurate Scoring of Drug Conformations at the Extreme Scale" won the Scale Challenge Competition at the IEEE CCGrid Conference, in Shenzhen (China). Congratulations to Boyu and Trilce who led the effort! Our talk can be downloaded here. Dr. Taufer speaks on "Numerical Reproducibility Challenges on Extreme Scale Multi-threading GPUs" at the NVIDIA GPU Technology Conference. Dr. Taufer speaks on "Enabling Scalable Data Analysis of Large Computational Structural Biology Datasets on Distributed Memory Systems" at the 2015 Hot Topics in High-Performance Distributed Computing Workshop. Dr. Taufer is the keynote at the Fifth International Workshop on Accelerators and Hybrid Exascale Systems (AsHES) in Hyderabad (India). Her talk is on "The Numerical Reproducibility Fair Trade: Facing the Concurrency Challenges at the Extreme Scale." Our work on "Performance Tuning of MapReduce Jobs Using Surrogate-Based Modeling" Has been accepted at ICCS. Congratulations Travis! Our work on "Accurate Scoring of Drug Conformations at the Extreme Scale" is a finalist of the 8th IEEE International Scalable Computing Challenge - Co-located with IEEE/ACM CCGrid. Congratulations Boyu! Dr. Taufer presents our work on "Enabling Scalable Data Analysis of Large Computational Structural Biology Datasets on Distributed Memory Systems" at the National Institute of Standards and Technology (NIST). Sean's summer work with Sarp Oral and Hai Ah Nam at Oak Ridge National Laboratory (ORNL) is in the ORNL news. Dr. Taufer was selected to serve on the SC Steering Committee. Congratulations! Our group is back from SC14 where we successfully presented our research. Sean was award with the first prize in the ACM Undergraduate Student Research Poster Competition. Stephen served on a panel of the Broader Engagement Program and spoke about how to submit successful research at the conference's Technical Program. Boyu presented her PhD work at the Doctoral Showcase. Vivek led the CIS presence at the UD research booth. Dr. Taufer was busy as the Tech Program co-Chair. It has been a very positive experience for all of us. Dr. Taufer is part of a team led by Dr. Tom Powers at the University of Delaware that has been awarded more than $200,000 by the National Science Foundation to collaborate with the National Academy of Engineering (NAE) on an international research ethics project. - See more HERE. Dr. Taufer was featured in the CUDA Spotlight for the work of our group on high performance computing (HPC) and its application to the sciences. - See more HERE. 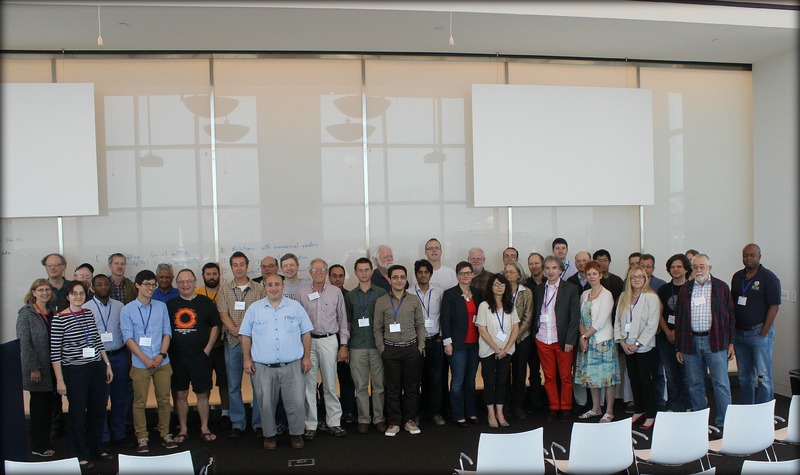 Dr. Taufer presented our research on "Facing concurrency challenges at extreme scale" at the workshop on Challenges in 21st Century Experimental Mathematical Computation at Institute for Computational & Experimental Research in Mathematics (ICERM). The list of speakers, the talk slides and videos can be found HERE. Our paper on "Applying Frequency Analysis Techniques to DAG-based Workflows to Benchmark and Predict Resource Behavior on Non-Dedicated Clusters" is one of the six Best Paper Candidate at CLUSTER 2014. Congratulations Vivek and Jeff! Dr. Taufer took part in the SC14 PC meeting in Houston. 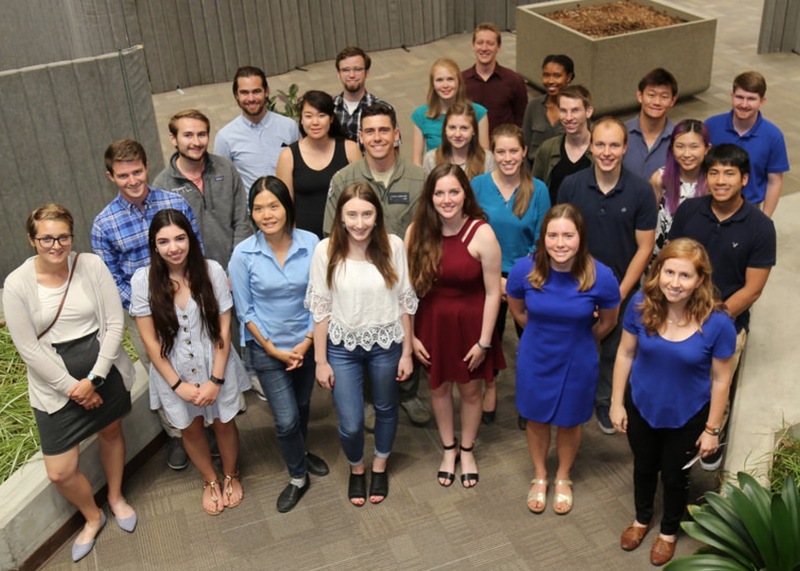 Boyu Zhang is spending her summer at Argonne National Laboratory working with Dr. Pavan Balaji; Sean McDaniel is spending his summer at Oak Ridge National Laboratory working with Drs. Sarp Oral and Hai Ah Nam; and Stephen Herbein is spending his summer at Lawrence Livermore National Laboratory working with Drs. Dong Ahn and Don Lipari. Have a fruitful summer Boyu, Sean and Stephen! Our work on "Benchmarking the Performance of Scientific Applications with Irregular I/O at the Extreme Scale " was accepted at the P2S2 workshop that is part of the ICPP conference ICPP. Stephen Herbein received the CIS Outstanding Senior Student Award. Congratulations Stephen! Taylor Baldwin received a Graduate Scholar Award for the academic year 2013-2014 from the University of Delaware in recognition to the prior academic achievements and the potential of success in the field of study. Congratulations Taylor! Paper on study the network impact on earthquake early warning in the quake-catcher network project to appear at ICCS 2014. Congratulations Sam and Marcos! Our work on "Performance Impact of Dynamic Parallelism on Clustering Algorithms on GPUs" was accepted at GTC 2014, March 24-27, 2014 in San Jose (CA). This is work led by Jeff. Congratulations Jeff! Our work on "Enabling in-situ data analysis for large protein folding trajectory datasets" was accepted to IPDPS14. This is work led by Boyu with the participation of Trilce Estrada at UNM and Pietro Cicotti at SDSC. Congratulations Boyu! 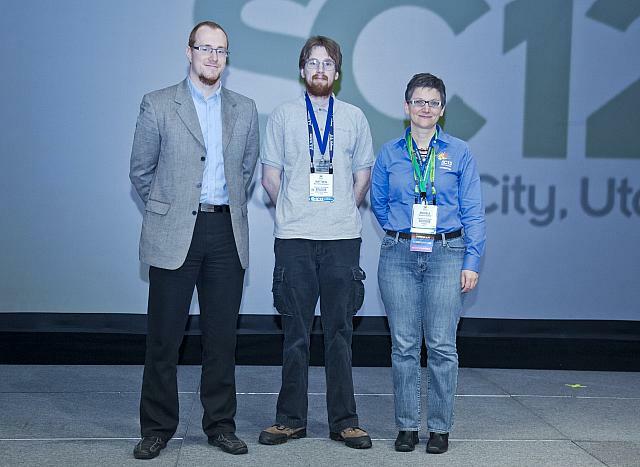 Stephen Herbein won the silver medal at the the ACM Student Research Competition that took place at the Supercomputing conference in Denver last week. 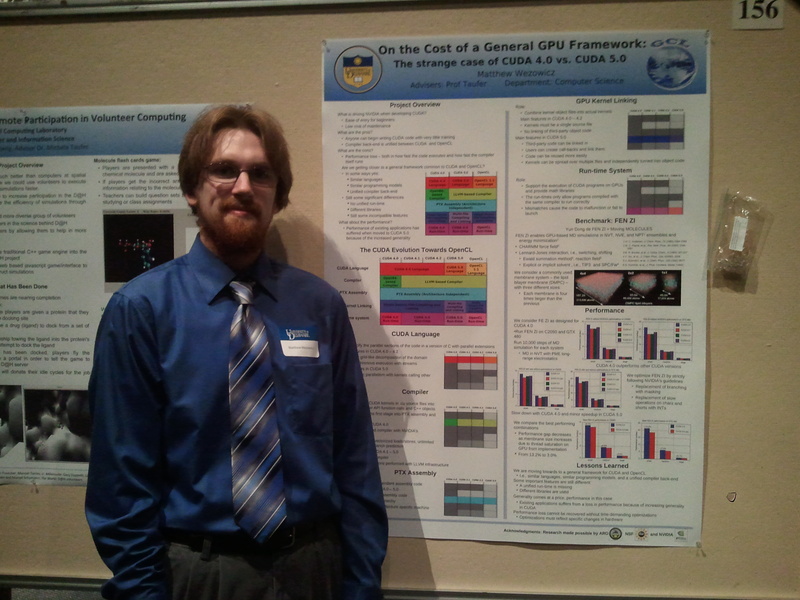 Stephen successfully presented his research done during the summer at ORNL in a poster and a short presentation. He was judged by a jury of experts and competed with other 25 UG students from top national and international universities. 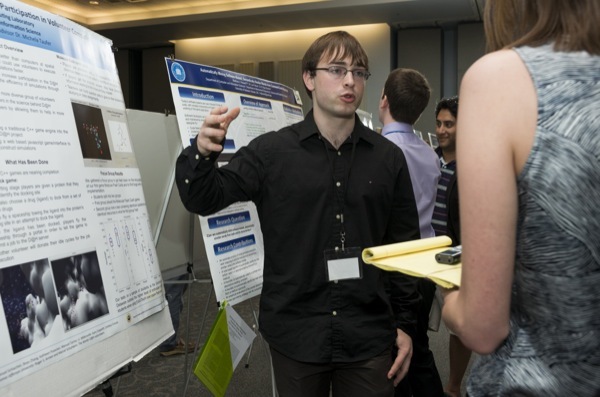 Michael Matheny also competed in the same category with his ORNL research and did outstanding work as well. Find a picture of the students including both our UD UG students Stephen Herbein and Michael Matheny at: HERE. A picture of Stephen at the awards ceremony can be found at: HERE. Both Stephen and Michael have been exceptionally great representing our school at the number one conference in HPC! Are you at SC13 on Nov 17-22? Visit our group on the exhibitor floor (UD Booth #3603) and meet Dr. Taufer, Sam, Stephen, Michael, and Cindy! Our group is sharing our software in GitHub. Find our MD code for GPUs FEN ZI and earthquake simulator QCN Explorer at GetHub. Visit QCNExplorer at qcnexplorer.org, learn how to monitor earthquakes with low-cost accelerometers connected to volunteer computers! Attending eScience in Beijing on Oct 22-25? Do not miss our eSON and main track conference talks. Papers available at GCLab webpage. Read our new FGCS journal paper on the powerful use of simulations in QCN to position low-cost earthquake sensors HERE. Two papers accepted at the 16th IEEE CSE Conference on (1) QMCPack+ADIOS and (2) Big Data+MapReduce. Well done GCLab! New NSF award for the Global Computing Lab to model and analyze big data on peta- and exascale systems. Read more about our new project on the NSF webpage . Trilce Estrada joined UNM as a faculty after a successful PhD and post-doc in our group. Congratulations Trilce! Michael Matheny, Stephen Herbein, and Matt Wezowicz were awarded with a SULI internship and are spending the summer at ORNL; Boyu Zhang was awarded with a XSEDE fellowship and is spending the summer at SDSC. A fruitful time to all of them! A new NSF award will allow the GCLab group to develop more efficient cloud computing. The project is featured in the UDaily magazine and is collaborative research wtih Rajmohan Rajaraman and Arnold Rosenberg at Northeastern University. Michael presented the results of his summer research at the UD Undergraduate Research Program’s Summer Scholars Poster Session. His research was featured in UDaily. Well done Michael! Michael was awarded with the Steven Geracimos Memorial Award and Stephen was awarded with the CIS Outstanding Student Award. Congratulations Michael and Stephen! Our work on "On the Powerful Use of Simulations in the Quake-Catcher Network to Efficiently Position Low-cost Earthquake Sensors" was accepted in the Future Generation Computer Systems. Congratulations Kyle, Sam, and Trilce! Our work on "Enhancement of Accuracy and Efficiency for RNA Secondary Structure Prediction by Sequence Segmentation and MapReduce" was accepted in the BMC Structural Biology Journal. Congratulations Boyu and Daniel! Our work on "Performance dissection of a Molecular Dynamics code across CUDA and GPU generations" was accepted at PDSEC on May 24, 2013 in Boston; our work on "Secondary structure predictions for long RNA Sequences Based on Inversion Excursions and MapReduce" was accepted at HiCOMB on May 20, 2013 in Boston. Congratulations Boyu, Matt and Trilce! FEN ZI code available for download! The code of FEN ZI is now available in Google Code. Let us know if you want to help extending the code. Any help or feedback is welcome! HPCwire reported on our paper in their article on SC12. Read more about our work in HPCwire in the article session on Self-Management for Volunteer Grids. 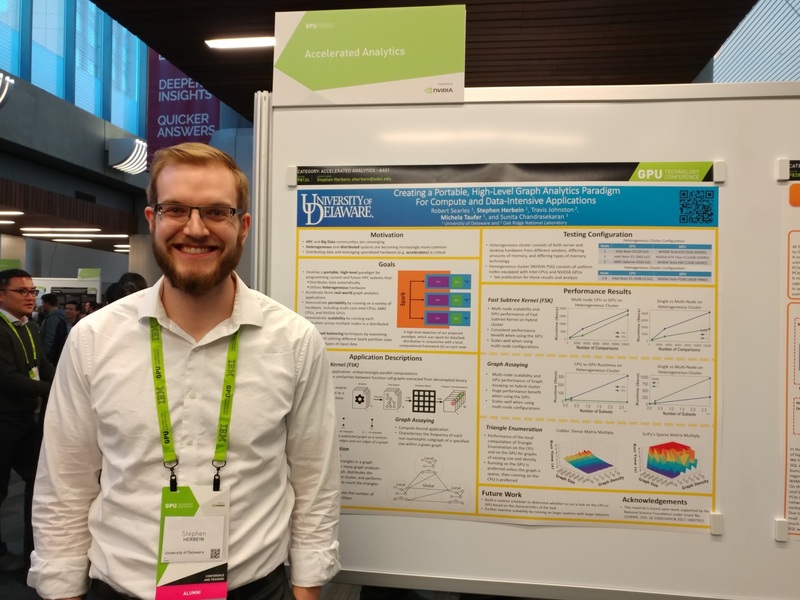 Matt Wezowicz was awarded with a silver medal in the ACM undergraduate poster competition with the poster "On the cost of a general GPU framework - The strange case of CUDA 4.0 vs. CUDA 5.0". Well done Matt! We are at SC12 in Salt Lake City, Utah. We are presenting posters showcasing the science enabled by our research. Please stop by our booth 2504 if you are attending too! Here you can find the exhibits floorplan. See you at SC12! Our work on the cost of a general GPU framework - The strange Case of CUDA 4.0 vs. CUDA 5.0 was accepted at SC12. Congratulations Matt! Our work on ExSciTecH: Expanding Volunteer Computing to Explore Science, Technology, and Health was accepted at the 2nd workshop on Analyzing and Improving Collaborative eScience with Social Networks (eSoN 12). Congratulations Sam, Michael, and Trilce! Our work on a modularized MapReduce framework to support RNA secondary structure prediction and analysis workflows was accepted at the 2012 Computational Structural Bioinformatics Workshop (CSBW). Congratulations Boyu! 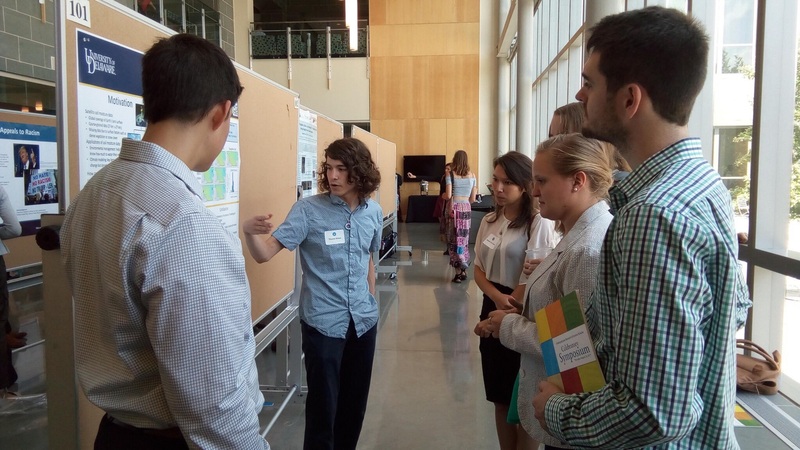 Matthew Wezowicz and Michael Matheny successfully presented their summer research at the poster session of the second annual Undergraduate Research and Service Symposium, to be held on Wednesday, August 9th at Clayton Hall, from 8:30 am - 4:30 pm at UD. Congratulations Matt and Michael! Our work on the effectiveness of application-aware self-management for scientific discovery in volunteer computing systems was accepted at SC'12. Congratulations Trilce! The CIS Department held its annual Honors Breakfast. At this breakfast, awards were given to honor the achievements of our students. Trilce Estrada won the prestigious Frank A. Pehrson Graduate Student Achievement Award. We just learned that two posters we submitted to GHC were accepted. The first poster is on "Benchmarking Gender Differences in Voluntary Computer Projects" and is collaborative work with the Kathy Pusecker and her team at the Office of Educational Assessment at UD and UVA. The second poster is on "a modularized MapReduce framework to support RNA secondary structure prediction and analysis workflows" and is work in collaboration with UTEP. Congratulation to Boyu and Trilce for leading the research! Our paper on "" was accepted at the 14th IEEE International Conference on High Performance Computing and Communications (HPCC 2012). This is collaborative research with Roger Armen (TJU) and Pietro Cicotti (SDSC). Kudos to Trilce and Boyu for leading the research! Trilce successfully defended her PhD thesis on the effectiveness of application-aware self-management for scientific discovery on volunteer computing system. Members on her committee were: Steve F. Siegel (University of Delaware), Martin Swany (Indiana University), Jon Wiessman (University of Minnesota), David Anderson (University of Berkeley), and Olac Fuentes (University of Texas at El Paso). Congratulations Dr. Trilce! Matt and Dr. Taufer attended the DSS11 SPIE Defense, Security, and Sensing Symposium in Baltimore. 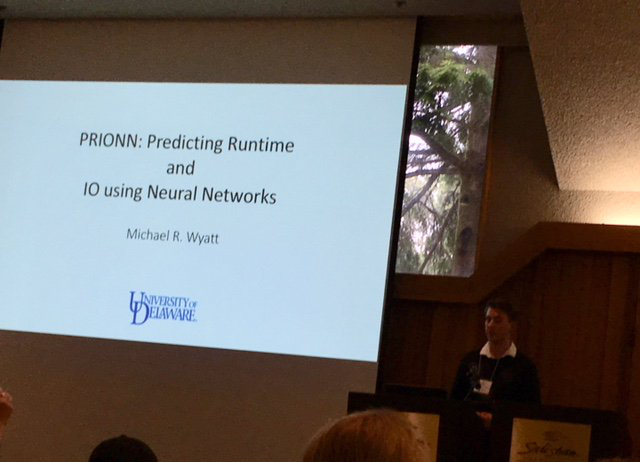 Matt successfully presented his work on Matrix multiplication module primes on GPUs at the session on Modeling and Simulation for Defense Systems and Applications VI. This is collaborative work with the LinBox group led by Dr. Saunders. Our group is featuring our research at the UD booth at SC'11 in Seattle from Nov 14 to Nov 17. Come by and meet us! Congratulations Omar, Boyu, and Will! Kyle and Trilce's paper "On the Powerful Use of Simulations in the Quake-Catcher Network to Efficiently Position Low-cost Earthquake Sensors" was accepted at eScience'11. This is the first paper for Kyle. Congratulations Kyle and Trilce!!! Our poster "Study of Protein-ligand Binding Geometries using a Scalable and Accurate Octree-based Algorithm in MapReduce" was accepted at SC'11. Congratulations Trilce and Boyu! 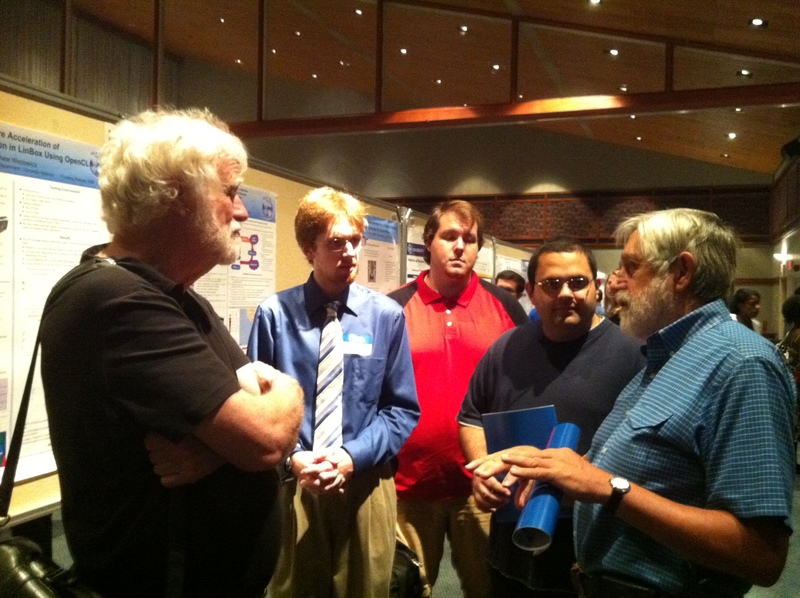 Matthew Wezowicz, Michael Matheny, and Samuel Schlachter successfully presented their summer research at the poster session of the second annual Undergraduate Research and Service Symposium, to be held on Wednesday, August 10th at Clayton Hall, from 8:30 am - 4:30 pm at UD. Click here to see the program. Congratulations Matt, Michael, and Sam! Our work on the simulation of QCN systems with EmBOINC was featured in the UDaily. This is work done by Kyle Benson, Trilce Estrada, Sam Schlachter, and Michela Taufer together with with Jesse Lawrence from Stanford and Elizabeth Cochran from the U.S. Geological Survey. Congratulations Kyle, Trilce, and Sam! 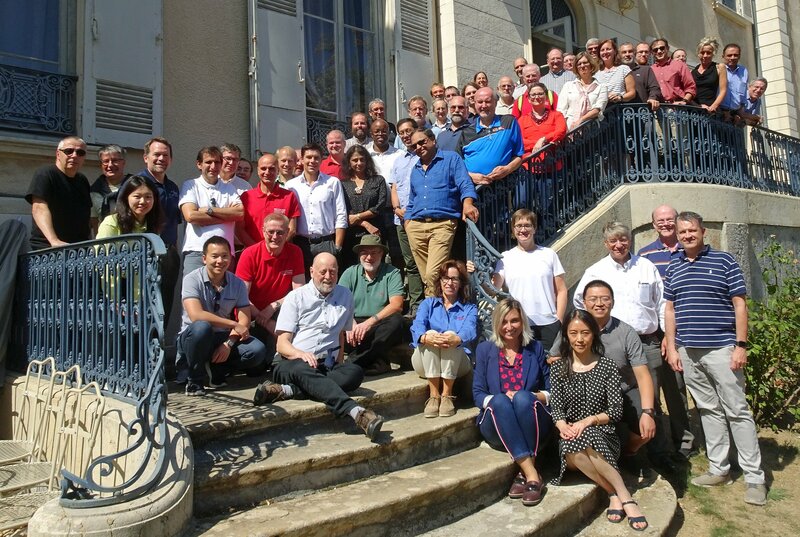 Results from our collaboration with Sandia National Lab and IBM on "Simulating Application Resilience at Exascale" is presented in a paper accepted to the 4th Workshop on Resiliency in High Performance Computing (Resilience) in Clusters, Clouds, and Grids, held in conjunction with the 17th International European Conference on Parallel and Distributed Computing (Euro-Par), Bordeaux, France, August 30, 2011. Rolf Riesen (IBM), Kurt Ferreira (SNL), Maria Ruiz Varela (UD), Michela Taufer (UD) and Arun Rodrigues (SNL) are the authors of this paper. Congratulations Maria! Our paper on "Providing Quality of Science in Volunteer Computing" has been accepted at the 13th IEEE High Performance Computing and Communications (HPCC) Conference in Baneful, Canada. Congratulations Trilce for your new paper! Two journal articles have been accepted in two prestigious journals, the Journal of Computational Chemistry and Journal of Chemical Information and Modeling respectively. Congratulations to Trilce, Narayan, and Michela who are authors on the papers! We successfully presented three posters at the Research Symposium on Bioinformatics and Systems Biology at DBI on "STRUCTURAL, DYNAMIC, AND ELECTROSTATIC PROPERTIES OF FULLY HYDRATED DMPC BILE'S FROM MOLECULAR DYNAMICS SIMULATIONS ACCELERATED WITH GRAPHICAL PROCESSING UNITS (GPUS)", "EXSCITECH: AN INTERACTIVE, EASY-TO-USE VOLUNTEER COMPUTING SYSTEM TO EXPLORE SCIENCE, TECHNOLOGY, AND HEALTH IN DRUG DESIGN", and "STUDY OF PROTEIN-LIGAND BINDING GEOMETRIES USING A SCALABLE AND ACCURATE OCTREE-BASED ALGORITHM IN MAPREDUCE". We successfully presented our poster at 3rd Annual Delaware Health Sciences Research Symposium at Thomas Jefferson University in Philadelphia on "STUDY OF PROTEIN-LIGAND BINDING GEOMETRIES USING A SCALABLE AND ACCURATE OCTREE-BASED ALGORITHM IN MAPREDUCE". Dr, Taufer presented our paper on "FENZI: GPU Enabled Molecular Dynamics Simulation of Large Membrane Regions Based on CHARMM Force Field and PME" at HiCOMB'11 during IPDPS'11 in Anchorage, Alaska. Matthew Wezowicz, freshmen in ECE with minor in CS, will work on migrating LinBox kernels to GPU Platforms. Michael Matheny, freshmen in CS with minor in CS, will work on building gaming environments for Volunteer Computing platforms. Samuel Schlachter, ECE senior with minor in CS, will work on simulating a grid of earthquake sensors using Volunteer Computing resources. Welcome to all! Kyle Benson has been awarded with the CIS Best UG Senior Award. Jason has been awarded with the Steven Geracimos Memorial Award. Congratulations Kyle and Jason for the well-deserved recognition! Visit our FENZI webpage to see our new movie gallery presenting simulations of large membrane systems. Our group will present work on GPU programming at SPIE'11 (paper title: Rolling partial prefix-sums to speedup evaluation of uniform and affine recurrence equations) and at HiCOMB'11 (paper title: FENZI: GPU-enabled Molecular Dynamics Simulations of Large Membrane Regions based on the CHARMM force field and PME). Read more about FENZI (yun dong de FEN ZI = Moving MOLECULES), our CUDA code for large-scale, GPU-based MD simulations using the CHARMM force field HERE. Contact us for more information on the code. Dr. Taufer presented our codes FENZI for MD simulations on GPU and our improved HMMERSearch code for GPUs Harvard Medical School as part of the "Enabling Discovery with Dell HPC GPU Solutions" event sponsored by Dell. Dr Taufer received a new NSF grant (NSF EAR #1027807) together with a team of Universities in California led by Jesse Lawrence at Stanford. The award will enable research on the volunteer computing framework supporting the Quake-Catcher Network (QCN) project. Together with our collaborator, Dr. Patel, Drs. Taufer and Ganesan presented our codes FENZI for MD simulations on GPU and our improved HMMERSearch code for GPUs at GTC 2010. The talks are available at the NVIDIA webpage. 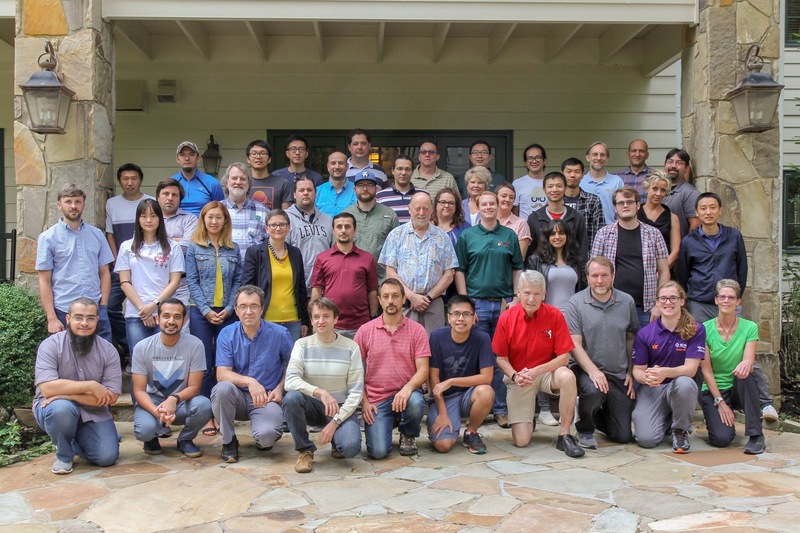 Our group has received an NSF Computing in the Cloud (CiC) supplement to use the Microsoft's Azure platform for the design and implementation of molecular dynamics codes for polarizable force fields on this cloud platform. Boyu and Maria received a Travel Grant of $2,000 each to attend Cluster 2010 in Greece on Sep 20-24. Congratulations Boyu and Maria! Our research on developing advanced GPU algorithms with EM Photonics for Air Force is featured in (HPCwire) and (UDaily). Dr Taufer received a new NSF grant (NSF IIS 0968350) together with the University of Virginia and the University of Millersville. The award will support the Docking@Home project for other three years. We have been invited to give two talks at two sessions at GTC 2010 in San Jose (CA) this September 20-23. We will speak about "Simulations of Large Membrane Regions Using GPUs" and "Reformulating Algorithms for the GPU". Together with EM PHOTONICS INC., a lead company in GPU programming located in Newark DE, our group has been awarded with an Air Force award for one year to work on accelerated linear algebra solvers for multi-core GPU-based computing architectures. The poster "Simulations of Large Membrane Regions using GPU-enabled Computations - Preliminary Results" was accepted at the 2010 Symposium on Application Accelerators in High Performance Computing (SAAHPC'10) on July 13-15, 2010 at the University of Tennessee Conference Center. Authors of the poster are: Narayan Ganesan,Sandeep Patel and Michela Taufer. Dr. Taufer won a University of Delaware Research Foundation (UDRF) Award to work on volunteer computing research. Trilce's paper "Automatic Selection of Near-Native Protein-Ligand Conformations using a Hierarchical Clustering and Volunteer Computing" and Narayan's paper "Breaking the Sequential Dependency Bottleneck: Extracting Data Parallelism in the Presence of Serializing Data Dependencies" were accepted at the International Conference On Bioinformatics and Computational Biology (ACM-BCB) in August 2010 in Niagara Falls, NY. Abel successfully defended his thesis entitled "RNAVLAB 2.0: COMBINING WEB APPLICATIONS, GRID COMPUTING, AND DYNAMIC PROGRAMMING TO OVERCOME RESOURCE LIMITATIONS IN RNA SECONDARY STRUCTURE ANALYSIS". Congratulations Abel!! Trilce Estrada received a Graduate Fellow award for the academic year 2010-2011 from the University of Delaware, and Philip Saponaro received a Graduate Scholar award. Congratulations Trilce and Philip! Abel's paper "A Dynamic Programming Algorithm for Finding the Optimal Segmentation of an RNA Secondary Structure Prediction" has been accepted at BiCOB 2010. Our group will present two papers related to GPU programming at IPDPS 2010. Congratulations Lifan, Philip, and Omar! Philip and Omar received the Dr. Robert M. Panoff award for their work on improving numerical reproducibility and stability in large-scale numerical simulations on GPUs. They will get the award at SC09. Philip and Omar's poster entitled "Improving Reproducibility and Stability of Numerically Intensive Applications on Graphics Processing Units" was accepted for presentation as a poster at NVIDIA Research Summit in California on Sep 30- Oct 2. 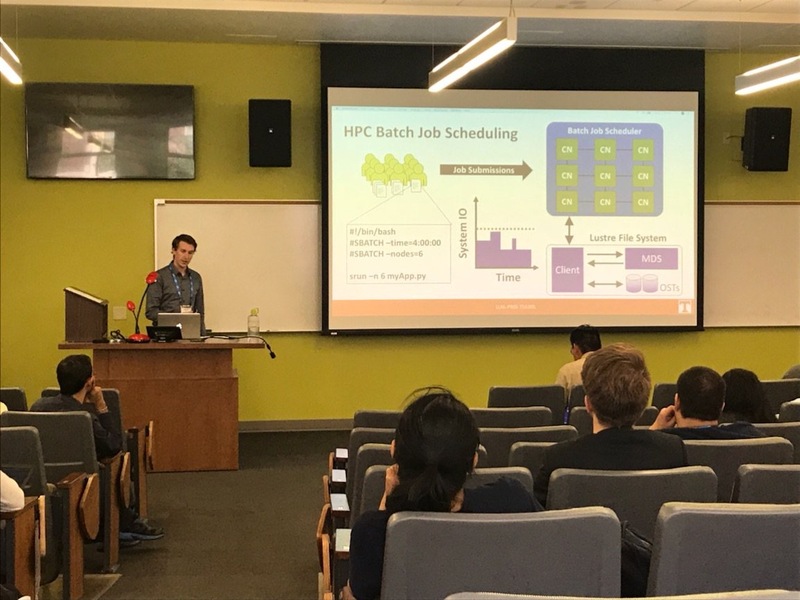 Trilce's PhD work titled "Providing QoS for heterogeneous workloads in large, volatile, and non-dedicated distributed systems" was accepted for presentation at the SC09 Doctoral Research Showcase. Lifan's poster titled "Parallelization of Tau-Leaping Coarse-Grained Monte Carlo Method for Efficient and Accurate Simulations on GPUs" was accepted for presentation as a poster at SC09. Trilce Estrada was awarded with a travel scholarship to attend GHC 2009. Trilce will also present a poster at the conference titled "Docking@Home: Searching for New Drugs using Volunteer's Computers". Penguin Computing delivers University Of Delaware’s fastest supercomputer to Global Computing Laboratory. The press release is available here. "Docking@Home" project featured by "Scientific American"
The human brain benefits from taking breaks, but a computer can go strong all day. So why not enlist its power in cutting-edge research with D@H while you are away reenergizing over coffee or lunch? Read more on D@H in Scientific American. jTopaz, an open-source GridFTP protocol extension to the Firefox browser, is now available to the public in Google Code. Our group presented our two projects Docking@Home and ExSciTecH in a computer showcase for the College of Arts and Sciences during the Forum & Reunion Weekend. More about our showcase here. Dr. Taufer awarded with an award 2009 from Army Research Office (ARO) to study design and implement computational tools for the study of new drugs augmented with accelerators, e.g., Graphics Processing Units (GPUs). Our group HPC Linux Cluster "Geronimo" from Penguin Computing is featured in the CIS webpage. Geronimo has a triple NVIDIA Tesla S1070 making use of GPUs (Graphics Processing Units) for scientific computation. Geronimo's 12 GPU's deploy 2880 processing cores and there are an additional 48 conventional CPU's. The floating point peak performance is 12.4 teraflops per second. For comparison, the largest Beowulf clusters on campus have peak performance of about 2 teraflops per second. Our group will use Geronimo to design, implement, and test high performance parallel algorithms for molecular modeling. Our paper "MNEOMIC: Network Environment for Measurement and Observation for Network Interaction and Control" has been accepted at GridPeer. Pat McClory, Ezra Kissel, Martin Swany and Michela Taufer are the paper authors. This is the first peer-reviewed paper of Pat. Congratulations Pat!! The University of Delaware first Forum & Reunion Weekend, June 5-7, offers alumni and friends more than the opportunity to reconnect with UD and one another and to celebrate with full schedule of parties and other entertainment. D@H will be part of the showcases efforts at this event. Read more in UDaily. Trilce received the Lauri Pfeffer Shin Memorial Award for her achievements and contributions. Philips has been awarded with the CSI Outstanding Student Award for his achievements. Congratulations Trilce and Philip! Philip was selected for the competitive UD Summer Scholars Program. The program will supports Philip while conducting in-depth research on mathematical libraries for GPUs in our group. Congratulations Philip! Abel Licon is the recipient of a competitive University Graduate Scholar Award for Fall 2009 – Spring 2010 at the University of Delaware. Congratulations Abel! Our paper "Applying Organizational Self-Design to a Real-world Volunteer Computing System" has been accepted at ADAPT 2009 Workshop. Chine Kamboj, Trilce Estrada, Keith Decker, and Michela Taufer are the paper authors. Congratulations Chine and Trilce!! The group has a new high-end cluster for our research projects. Read more about the cluster here. Our paper "Balancing Scientist Needs and Volunteer Preferences in Volunteer Computing using Constraint Optimization" has been accepted at ICCS. James Atlas, Trilce Estrada, Keith Decker, and Michela Taufer are the paper authors. Congratulations James and Trilce!! Our paper "Modeling Job Lifespan Delays in Volunteer Computing Projects" has been accepted at CCGrid. Trilce Estrada, Kevin Reed (IBM), and Michela Taufer are the paper authors. Congratulations Trilce for the second paper in a week!! Our paper "EmBOINC: An Emulator for Performance Analysis of BONING Projects" has been accepted at the PCGrid workshop. Trilce Estrada, Kevin Reed (IBM), David Anderson (SSL, UC Berkeley) and Michela Taufer are the authors. Congratulations Trilce!! Our paper "Towards Large-Scale Molecular Dynamics Simulations on Graphics Processors" has been accepted at the International Conference on Bioinformatics and Computational Biology (BICoB) in April 2009 in New Orleans, Louisiana, USA. Congratulations Joe and Adnan! NVIDIA University Professor Partnership Program Award. The GCLab has been awarded with a Tesla S1070 to continue our research on Molecular Dynamics simulations on GPUs. We are very grateful to NVIDIA and its University Professor Partnership Program for the support. Three GCL students at SC'08. Trilce, Abel, and Pat have been selected to serve as SC volunteer students. This year SC is in Austin, TX and our group will present our research at the UD booth. Abel Licon awarded a Google HSF Scholarship. Abel Licon has been awarded with a $10,000 Google HSF scholarship for the academic year 2008-2009. Congratulations Abel! GCLab will host the first East Coast BOINC meeting on BOINC in Research, Science, and Education. More about the meeting and how to attend here. Dr. Taufer vice-chair of HPCC 2009 for the Distributed Systems and Applications track. Submission deadline is January 16, 2009. 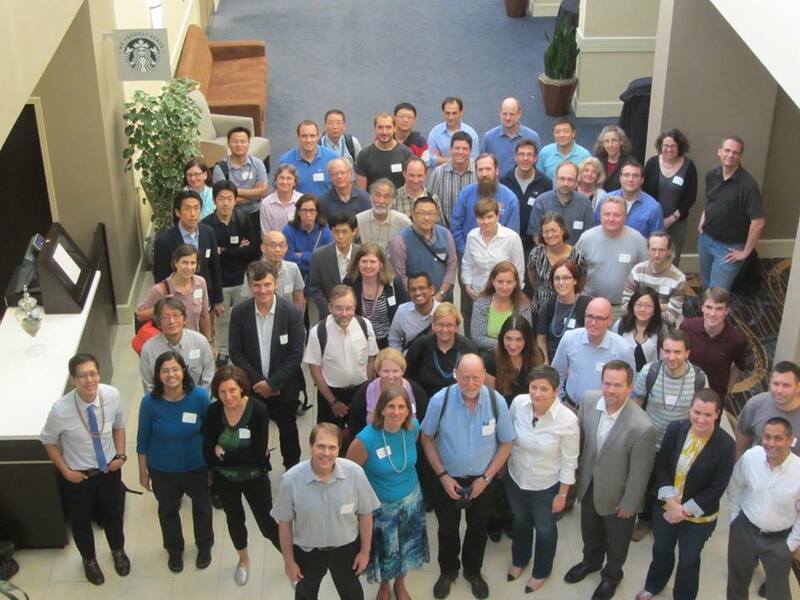 Dr. Taufer presents the Docking@Home project at the CRA-W/CDC Systems Research Mentoring Workshop on June 16-18 at the University of Delaware. More about the workshop here. Our group has been awarded with a new NSF grant that for 4 years will allow us to study mathematical models for RNA. This is collaborative research with Drs. Lueng and Johnson at the University of Texas at El Paso. Trilce and Dr. Taufer attended Computing Frontiers 2008. Trilce presented our paper "A Distributed Evolutionary Method to Design Scheduling Policies for Volunteer Computing". The paper is join research with Dr. Fuentes at the University of Texas at El Paso. Our group presented our research work at MASPLAS 2008 in Princeton on April 26. Abel Licon was awarded with a UDel Graduate School Travel Scholarship of $300 to attend IPDPS in Miami, Florida. The department will match the award with $300. Congratulations Abel! Trilce Estrada was awarded with the Alumni Enrichment Award of $2000 from the UD Alumni Association Board of Directors to attend the ACM International Conference on Computing Frontiers 2008. Congratulations Trilce! In summer our group will host Brenda Medina and David Mireles, two undergraduate students from the University of Texas at El Paso, for 10 weeks to work on research projects that target biological applications and their efficient migration to distributed systems. The project is supported by CRA and NSF. The paper "A Distributed Evolutionary Method to Design Scheduling Policies for Volunteer Computing" by Trilce Estrada, Olac Fuentes, and Michela Taufer has been accepted at the ACM Computing Frontiers 2008. Trilce and Dr. Taufer will attend the workshop in May in Ischia, Italy. The SIG-SYS seminar starts on Feb 13 and takes place every Wed at 12:20 in Smith Hall, room 102A. The tentative schedule is now available here. Contact Dr. Taufer if you want to present your work in our seminar. The paper "On the Effectiveness of Rebuilding RNA Secondary Structures from Sequence Chunks" by Michela Taufer, Thamar Solorio, Abel Licon, David Mireles, and Ming-Ying Leung has been accepted at the Seventh IEEE International Workshop on High-Performance Computational Biology (HiCOMB'08). Abel and Dr. Taufer will attend the workshop in April. Dr. Taufer has been invited to give a talk at the 20th Annual CSU Biotechnology Symposium at the Oakland Marriott City Center in California. 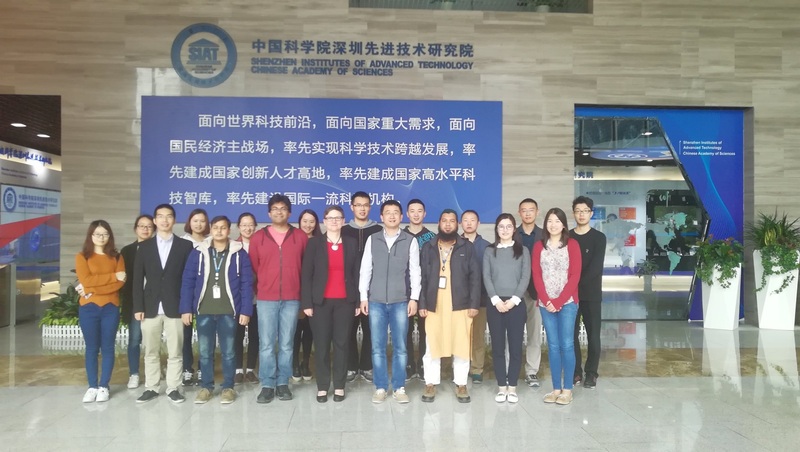 The talk, titled "Computational Multi-scale Modeling in Protein-ligand Docking", was part of a special session on "Interfacing Computer Science & Biotechnology". Click here for the schedule of the symposium and Dr. Taufer's abstract. This year's SuperComputing conference in Reno, Nevada has been very successful. For the first year we have been sharing an exhibition booth with several faculty at the CIS dept. and Dr. Gao's group at the ECE dept. The University of Delaware had many interesting posters to show and a screen with short presentations on our work. Many people (incl. funding officers from many funding agencies) came by the booth and were very impressed with our work. Visit our photo gallery of our booth at SC'07. See you all again at SC'08 in Austin, TX. 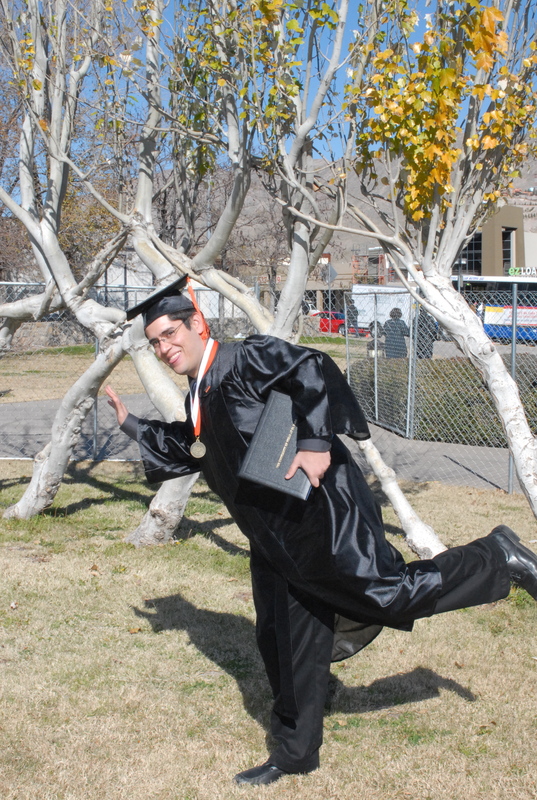 Abel graduated at the University of Texas at El Paso. He will join us at UDel in January. 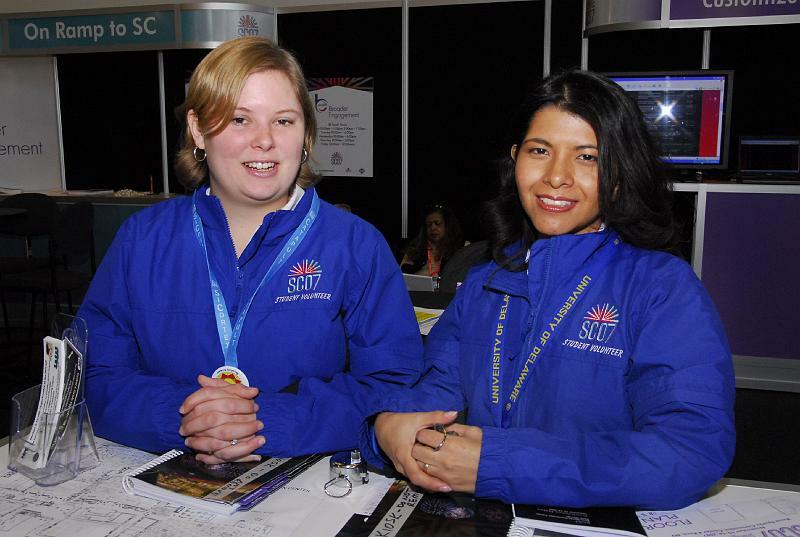 Michela Taufer and Trilce Estrada will attend SC'07 and will be at the University of Delaware booth, number 3315. Visit us for more information about our research! Our poster "Performance Analysis of Volunteer Computing Traces" has been accepted at SC'07. Authors are: Trilce Estrada and Michela Taufer (GCLab) and Kevin Reed (IBM). David Mireles awarded a Google HSF Scholarship. The Global Computing Lab will move to the University of Delaware in Fall 2007. The paper "Evaluation of IEEE 754 Floating-Point Arithmetic Compliance Across a Wide Range of Heterogeneous Computers" by G. Lopez, M. Taufer, and P.J. 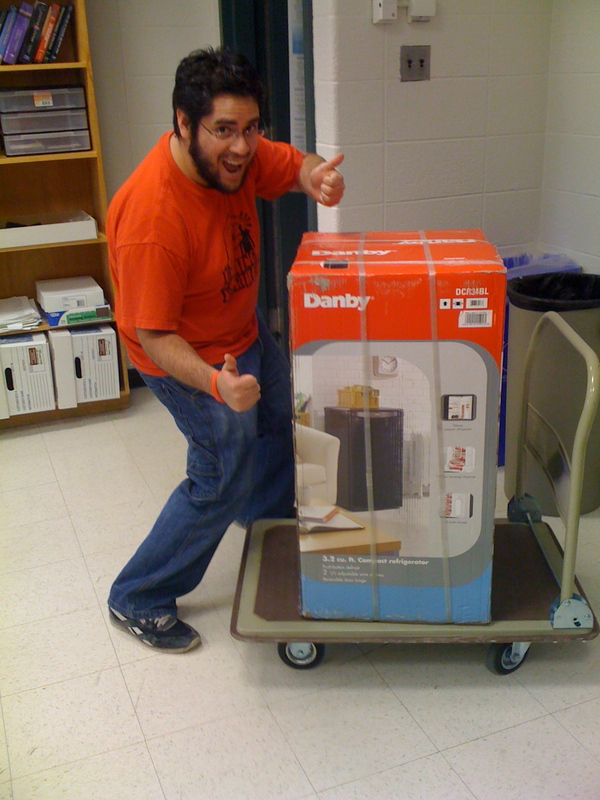 Teller has been accepted at the 2007 Richard Tapia Celebration of Diversity in Computing Conference that takes place in October, in Orlando, Florida. This is the first paper of Memo. Congratulations Memo! Memo Lopez has accepted a position at Ximis (El Paso, Texas) and Richard Zamudio has accepted a position at Rockwell Collins (Iowa). Congratulations Memo and Richard! David Mireles (UG student in the Global Computing Lab under the supervision of Thamar Solorio and Michela Taufer) has been awarded by the prestigious fellowship for the 2007 Data Sciences Summer Institute (DSSI) at the Multimodal Information Access and Synthesis (MIAS) Research Group of the University of Illinois at Urbana , Department of Computer Science. David will spend two months at the the University of Illinois at Urbana and will be Undergraduate Research Fellows supported by a monthly stipends. Richard's Master Thesis entitled "TOPAZ: A FIREFOX PROTOCOL EXTENSION FOR GRIDFTP" has been selected as "Outstanding Thesis in the Department of Computer Science". Drs. Taufer and Teller (UTEP) as well as Dr. Armen (TSRI) will present our project, DAPLDS, and the docking@home portal at the MSM Consortium meeting at NIH. Dr. Taufer, Richard Zamudio, and Abel Licon attend IPDPS 2007 in Long Beatch, California. We will present papers on our research at HiCOMB'07, HPGC'07, and PCGrid'07. David Mireles, one of our undergraduate students in the GCLab group, has been selected as a 2007-2008 Microsoft Technical Scholarship recipient. David will received finical support for his tuition and will participate to a 12-week internship at Microsoft this summer. Congratulations David! Our paper "Topaz: Extending Firefox to Accommodate the GridFTP Protocol" has been accepted at the Workshop on High Performance Grid Computing (HPGC 2006). Our paper "Moving Volunteer Computing towards Knowledge-Constructed, Dynamically-Adaptive Modeling and Scheduling" has been accepted at the Workshop on Large-Scale and Volatile Desktop Grids (PCGrid 2007). Our paper "SimBA: a Discrete Event Simulator for Performance Prediction of Volunteer Computing Projects" has been accepted at the International Workshop on Principles of Advanced and Distributed Simulation 2007. Richard Zamudio is discussing his Master's thesis today at 3PM in room CS 221. The title of Richard's thesis is: "TOPAZ: A FIREFOX PROTOCOL EXTENSION FOR GRIDFTP". Visit us at SC'06. We are presenting our research at the GCLab at the exhibitor booth #451. We are sharing the booth with the University of New Mexico. We are looking forward to meeting you at SC'06! Applications for Spring 2007 now being accepted! Download the application form for a Spring 2007 SHiPPER scholarship here. Please read the eligibility requirements before to apply at the SHiPPER web page. New portal for the Working Group 5, working group part of the MSM Consortium, now available here. 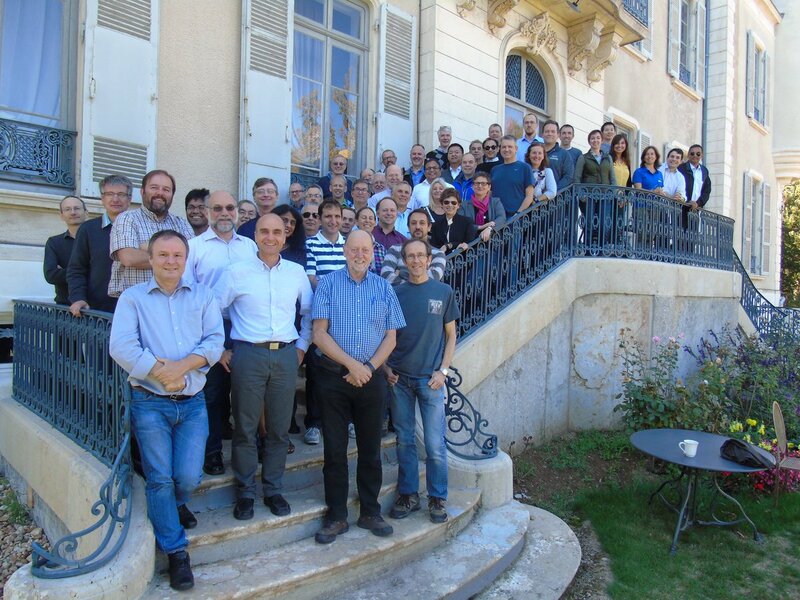 The goal of the working group is to discuss aspects related to high-performance computing, computational issues, and algorithms that are common to our different projects funded within the Multiscale Modeling Initiative. In October the working group hosted Kelly Gaither (TACC) in their monthly phone meeting to discuss about visualization and data analysis tools on TeraGrid. Richland, Daniel and I have just published an article on the electronic journal of IBM, DevelopWork. The title of the article is: "Integrate GridFTP into Firefox/ - Build grid protocols into Mozilla-based tools". This is joint work with Karan Bhatia and Brent Stearn at SDSC. The article can be read at: http://www-128.ibm.com/developerworks/grid/library/gr-firefoxftp/ and presents a link to the Global Computing lab at UTEP. Great news for our group! The paper "Extending Grid Protocols onto the Desktop using the Mozilla Framework" has been accepted to the 2nd International Workshop on Grid Computing Environments (GCE 2006), in conjunction with SC 2006. Congratulations to Richard and Daniel who are authors of the paper together with me, Karan Bhatia (SDSC), and Brent Stearn (SDSC). Dr. Teller and Dr. Taufer have been awarded with an NSF grant. The title of the grant is: SHiPPER: Spreading High-Performance computing Participation in undergraduate Education and Research. 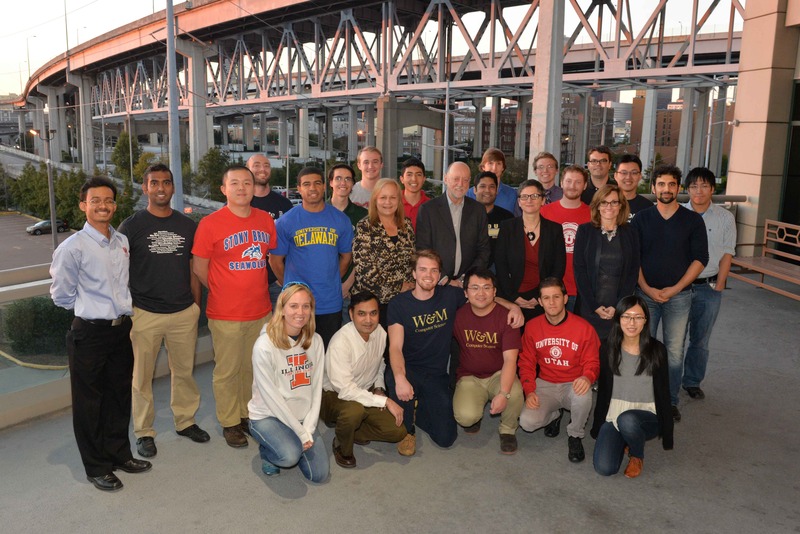 The grant aims to create and consolidate a community of UG and graduate students who will pursue advanced degrees in fields that combine expertise in high-performance computing and other scientific and engineering disciplines. Trilce, Abel, and Dr. Taufer have a paper accepted to the 1st Frontier on High Performance Computing and Networking Workshop (FHPCN 2006) (in conjunction with ISPA 2006, December 2006, Sorrento, Italy). The title of the paper is: CompPknots: a Framework for Parallel Prediction and Comparison of RNA Secondary Structures with Pseudoknots. This is the first paper for Abel!!! Dr Taufer invited to give a talk at the 19th Rocky Mountain Regional Meeting of The American Chemical Society. Dr. Taufer has been invited to present her work on protein structure prediction using volunteer computing at the 19th Rocky Mountain Regional Meeting of The American Chemical Society that will take place in October 15-18 2006 in Tucson, AZ. The title of Dr. Taufer's presentation is: Predictor@Home: A Protein Structure Prediction Supercomputer Based on Volunteer Computing. Join us to test our new version of Topaz, the GridFTP protocol extensions for Firefox browser. To download Topaz click here. Daniel Catarino awarded a Google HSF Scholarship. Trilce Estrada awarded Conacyt fellowship. Adrian Garcia selected to participate in the High Performance Computing in Action Summer Institute at the University of Hawaii. At the annual President's Proposal Writing Reception, Dr. Taufer receives the College of Engineering Young Investigator Award. Dr. Taufer's work on RNA Secondary Structure Prediction Using a Grid of Heterogeneous Computers receives ARP funding. The paper "A Systematic Multi-step Methodology for Performance Analysis of Communication Traces of Distributed Applications based on Hierarchical Clustering." by G. Aguilera, P.J. Teller, M. Taufer, and F. Wolf has been accepted to appear in the Proceedings of 5th International Workshop on Performance Modeling, Evaluation, and Optimization of Parallel and Distributed Systems (PMEO-PDS 2006), in conjunction with IPDPS 2006, April 2006, Rhodes Island, Greece.